When it comes to fishing for steelhead, knowing how to read the water can make the difference between going home skunked and having the fight of your life with 15 pounds of muscle. It can take years to learn how to read water, but once perfected, experts can spot fish holding spots from a mile away and are rarely surprised when they hook a fish. One of the toughest parts about pursuing steelhead is finding them. 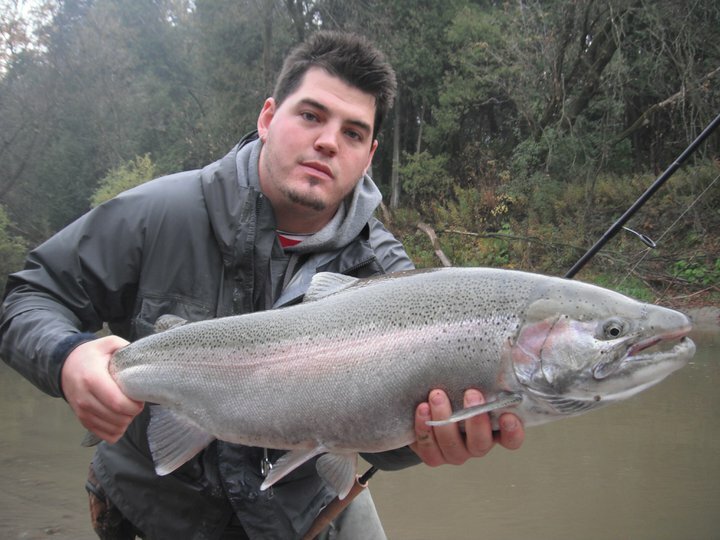 Here's some advice on finding steelhead from a couple of the top steelheaders on the planet. If the water is high i look for nice flats where you can see right to the bottom. Fish tend to hold on those flats and people walk right by them. My favorite time to fish steel is late fall and winter when you have that dark green water color, that?s when its on!! When all else fails and the creeks are unfishable but the winds are right I hit the mouths of the rivers. Its hit or miss on the big water but every once in awhile you have epic days just pounding steel . Long story short i watch the rains and the water level and that?s how i decide where I'm gonna go! Steelhead are a migratory species of fish, heading into the rivers to eventually spawn. One has determine what stage the run is at...is there fresh fish still coming in and moving up river, has the majority of the run move in and up, or have they finished spawning and are now moving down. The fresher the fish the more likely they will be downriver closer to the lake or main river they are coming up from. Fish that are moving, generally do so under warmer water temps, and can be targeted at 'neck down'(funnel) areas, or in resting in slightly calmer holding water, closer to the top of sets of faster water. Look for holding spots, were they can get out of the current and rest between moves, surface boils in the current often indicate big rocks, or some sort of structure and the fish will hold in front or behind resting from the main current. Typically, steelhead will hold in water with current about the same pace as a brisk walking speed, and they do not like water that is really 'swirly' with lots of upwells. They do like to have some depth, to provide cover from overhead, or in smaller systems, where deeper water is scarce, they will move into wood jams, undercut banks etc. that will provide some type of cover. The warmer the water temps, the faster or shallower they will be. As steelhead get closer to their spawning areas, water temps will have dropped, and they will start to stage in 'wintering' type holes waiting for ideal conditions/spawning time. Wintering holes in the main rivers, are usually just downstream from spawning tributaries, and they tend to be deeper and much slower moving. Under the cold water/winter conditions, steelhead will trend to hold in the lower parts of these pools, often where the deepest part of the hole starts to shallow up into the tail out, they will be deeper, but not usually in the deepest part of the pool. When the temps are warmer, the steelhead will hold in the tailouts primarily, but will move in the pool often to the head of the pools to sometimes feed or to continue to push upriver.Like any fish and fishing in general, there are no set rules, and everyday on the river can be different, but hopefully this will give you a base guideline to start putting the picture together to help hook up with steelhead. That's it for this edition of "Pros Weigh In." Hope the tips you read here will help you out the next time you hit the water for some winter steelhead action. If you have an idea for a future "Pros Weigh In" article, you can suggest it in the comments section below or email me at wfnwest@gmail.com. Thanks for reading!